I have lots of recipe books, and I do like sitting down and browsing through them. But, I don’t do this nearly as much as I should to gain new inspiration. It’s lovely, therefore, to come across recipes that inspire me in the land of blog. This week I’ve encountered several that are now on my list of ‘must try’ and a couple that I tried straight away. The first was koftas – little meaty sausages/patties served with flat bread and spicy condiments. I have to confess that I now can’t remember which blog I saw these on. I didn’t write down the recipe because it was so easy – minced lamb, garlic and seasonings mixed together, rolled into little shapes, put on one side for a while and then cooked in a pan without any oil added as lamb is fatty anyway. My only modification was that I used mutton rather than lamb – it has more flavour, its use means the animals have a longer life and graze naturally rather than being brought on using concentrates (as much lamb is) and apparently it’s good for you. The reason this recipe appealed so much was that I could serve it with a whole host of home made/home grown things: lettuce picked fresh, flat breads made by Mr Snail, dollops of the delicious sweet hot chilli sauce, home made yoghurt and freshly stewed apples. I can report that is was all delicious – certainly something we’ll be cooking time and again. The other recipe I tried this week was for Dutch Apple Pie… in my life I have made many apple pies but, trust me, this one was really special and different from any I’ve made before. The buttery crust is delicious, and the filling – made with sugar, corn starch, water, cinnamon and apples – was wonderful. For this one, I can direct you to the recipe, it’s from Amanda, The Farm Wyfe and you can find it here. In her post, Amanda also mentions apple brownies, which she has also kindly given me the recipe for… see her response to my comment at the bottom of her pie original post if you want this. 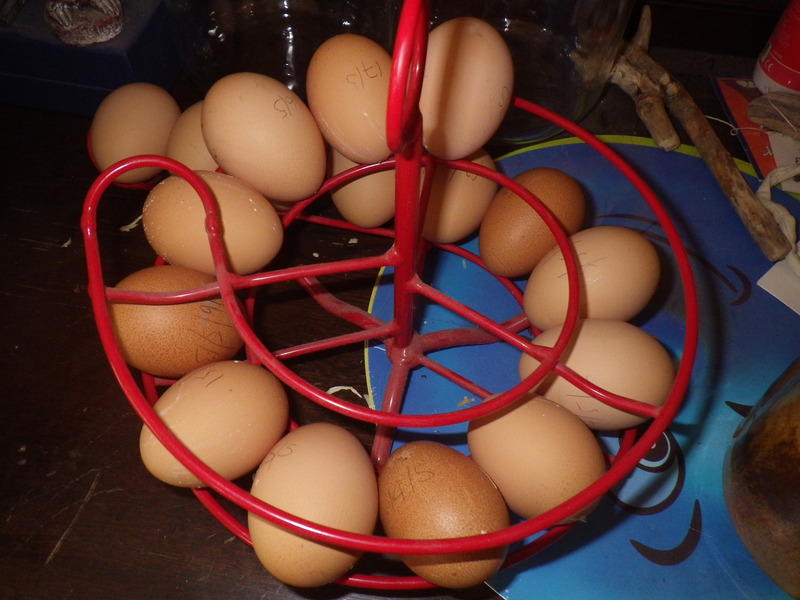 In addition, Kate (Tall Tales from Chiconia) sent me a cake recipe earlier in the week, but since it requires lots of eggs and our girls are hardly laying at the moment, trying that will have to wait. So, have you come across any good recipes in blogland recently? If so, do share! I am still occupied by the idea of homemade underwear. You may remember me mentioning my friend Seema, who makes her own knickers. She recycles old t-shirts and the suchlike as a way to avoid buying new items in order to reduce her environmental impact. It turns out that Seema and I are not the only people interested in this subject. A number of courses have been brought to my attention at which I could learn to make my own (in some cases very fancy) knickers. But places like The Make Lounge and Emiliana Underwear are a long way from west Wales (although the latter does sell kits) and I simply can’t afford the time and travelling expense. So, I turn to the internet for further inspiration and discover an abundance of patterns for knitting your own knickers… many from the 1940s. Fabulous forties fashions, for example, sell patterns for knitted knickers, vests and the marvelously named ‘pantie-vest’… a garment that seems to be designed to be impossible to extricate oneself from without disrobing completely! They even sell a pattern for crocheted bras! I confess, however, that discussions with ladies who experienced such garments in their past reveals (not literally) their propensity (the underwear not the ladies) for bagginess and I suspect that, even using modern yarns containing lycra (or similar), they would still be saggy and almost certainly rather bulky… not to mention the likelihood of chafing! Several ladies have also described having knitted swim-wear when they were girls, including the horrors of emerging from the water in a progressively enlarging costume! Fortunately I am young enough never to have been exposed to such traumas and I’m not about to start now. So, I don’t know about you, but I think I’ll give underwear making a miss for the time being and stick to knitting socks, cardigans and snails! Recently we have been rather eggy… no, not annoyed, just egg-full! Lorna has pretty much given up laying, despite only being three years old: we haven’t had an egg from her since Christmas. The other three (including Esme, who is the same age as Lorna) are giving us an egg each almost every day. Even with an occasional day off, this means we are getting about 18 eggs per week. I think that this level of production is being supported by the abundant leafy greens that they are consuming: kale, broccoli leaves and a wide variety of oriental leaves from last autumn’s planting (which we too are enjoying). It’s great to feel that the garden is so abundant, but sometimes the number of eggs does seem overwhelming. The easiest solution is to give them away: our lovely neighbours look after the hens when we are away for a weekend and so we often give them a box of eggs. However, we do like to make use of much of what we produce ourselves and, to this end, recipes that include eggs are really useful. Of course, there’s always cake, but if all the eggs went into cakes, we’d be the size of elephants by now… or perhaps the shape of Humpty-Dumpty! We often have poached or boiled eggs for our lunch – always with homemade bread using our locally milled flour, but even that has its limits. Recently we have been enjoying Scotch Eggs made with Glamorgan Sausage (breadcrumbs, cheese, sage and onion bound together with beaten egg). This is a lovely combination of flavours, but being deep-fried we don’t want to have them too often.We also quite often have hard-boiled eggs (7-8 minutes so the centre of the yolk is still soft) with garlic mayonnaise (again made with fresh eggs if I have the time) as an element of Tapas, along with patatas bravas, broad beans with spring onions, monkey bread and fried sweet peppers… all of which often have elements from out of the garden. Alternatively, a Spanish tortilla always goes down well – sometimes spiced up with some small chunks of chorizo in it. Perhaps the least egg-like use is making pasta. For every 100g of flour in the pasta, you use 1 egg. That’s it as far as ingredients are concerned – it just takes some kneading and quite a lot of rolling. We do have a little pasta machine for rolling it out (like a tiny mangle that you clamp to the work surface) which makes life easier, but it’s not necessary. Mr Snail-of-happiness usually makes the pasta and then I use it for cooking, so it’s a team effort. 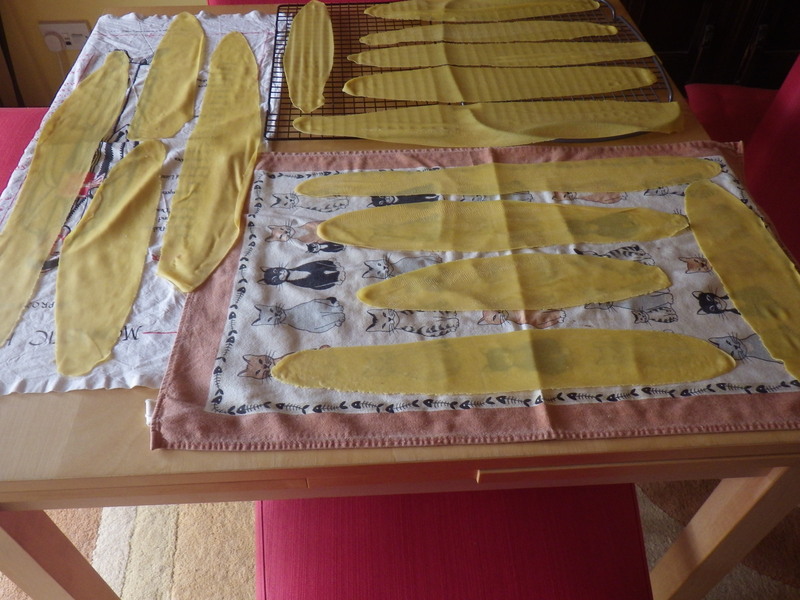 I usually make it into a layered lasagne, but I think I might have a go at fresh ravioli next time we make it. It’s great because you can freeze it too. So, those are some of my favourite egg dishes, but I’m always looking for new ones. Do you have any suggestions? As is clear from many of my posts, I love making things: from bottling a surplus of apples, to knitting socks, to crocheting bath puffs (yet more on that in a later post… I have a new yarn to try out: a recycled cotton and acrylic blend). I accumulate scraps of ‘stuff’ – fabric, yarn, old packing material, envelopes, buttons, shiny things – and enjoy turning these into something useful or lovely or just fun. 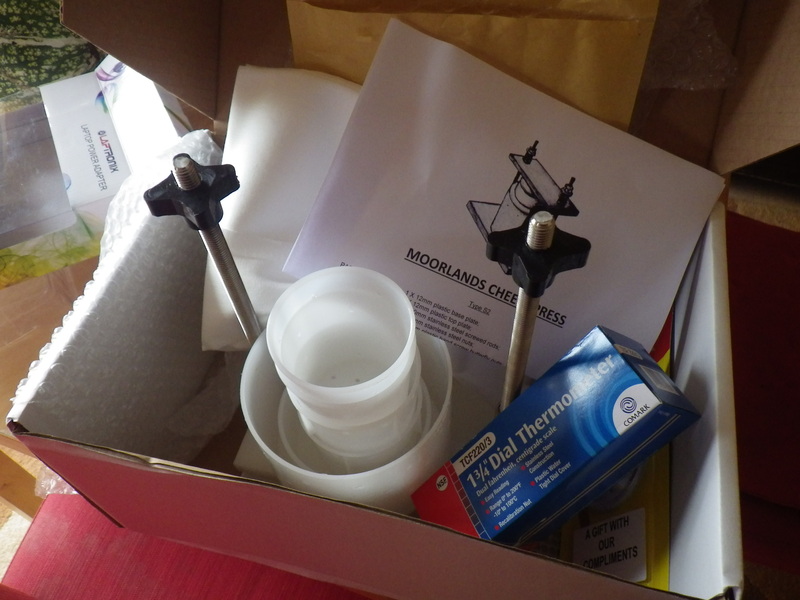 I do buy materials, particularly knitting yarn and wool for felting, but one of the enjoyable aspects of crafting and cooking for me is using things that would otherwise go to waste or have a very short useful life. 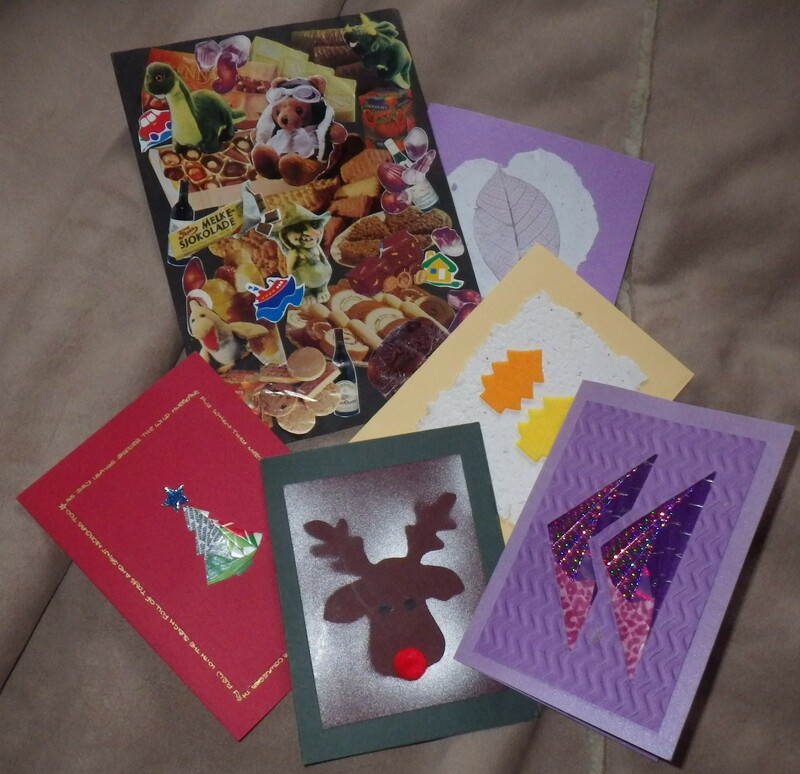 A few of my homemade cards… made with this and that! So, I’m not keen on packs containing everything you need for a particular project… partly because I want to make use of things I already have and partly because I like to make something that is unique. If I go out and buy a pack of “everything you need to make this lovely birthday card”, then I’ll just end up with something like everyone else has made, and I might as well have gone to Hallmark. I want to be individual and express my own creativity – even if it is a bit wonky sometimes! I know that things like knitting patterns should result in end products that are standardized, but there’s always room for creativity whether in using a yarn from your ‘stash’, choosing a new yarn, or just doing things a little bit different (for which there are endless opportunities when knitting!). I do buy nice ‘bits’ to use in my crafting, but I don’t want the whole thing handed to be in a pack. But my current bug-bear is something pretending to be a craft when it isn’t – things that are pseudo-homemade. Just like a cake mix isn’t, to me, really homemade – a pair of slippers that come as two single flat pieces and are each fastened together with a lace (the colour of which you can choose) are not homemade. I don’t think I am a carpenter because I can build an Ikea bookcase, so constructing a pair of ‘flat pack slippers’ isn’t craft! I guess that the issue is that craft is now ‘big business’. You only need to visit Pintrest and Etsy to see the massive interest in handmade items. And, of course, as part of the increasing drive towards consumerism, there are ample opportunities for big companies to take advantage. So, in another act of civil disobedience… cast off your desire to make the perfect card/cake/dishcloth/whatever and use up some of the things you have around the place to express your creativity. You never know, you might create a masterpiece… and you will certainly end up with something unique!